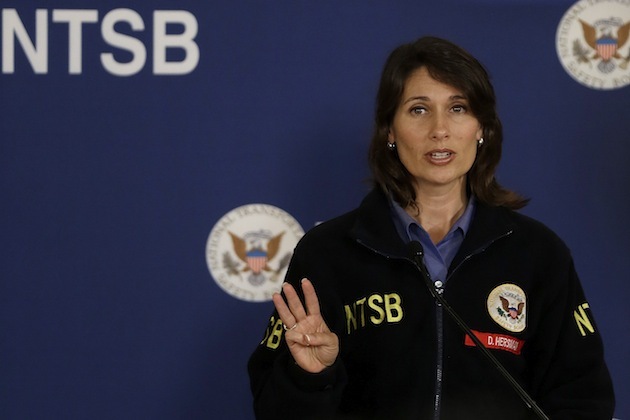 The Asiana Airlines Flight 214 that crashed at San Francisco International Airport has catapulted Deborah Hersman, the National Transportation Safety Board chairwoman, into the spotlight. From her first news conference, her calm voice and patient explanations have brought attention to the seemingly unshakeable and perfectly polished 43-year-old. This is hardly Hersman’s first rodeo: She was appointed to the board of the NTSB by President George W. Bush in 2004 and sworn in as chairwoman in 2009 under President Barack Obama, becoming at 39 the youngest person to fill the post. She oversees an organization of 400 with a $100 million budget that responds to transportation disasters. Recommendations to make travel safer are nonbinding. Hersman is no stranger to transportation disasters -- she has been involved in investigating several big ones, including Colgan Air Flight 3407 near Buffalo in 2009, which killed 50 people. The daughter of a Vietnam war vet, she graduated from Virginia Tech with degrees in political science and international studies, according to the NTSB website. She received a master's in conflict analysis and resolution from George Mason University. But academics were not all that kept her busy. Hersman told VT magazine she was in leadership in sororities and fraternities, as well as a resident adviser and a head resident adviser. “I had a very busy four years. It taught me to multitask and to take advantage of all the opportunities in front of me," she said. The profile in the alumni magazine says that in addition to her many extracurricular activities, she worked in the dining hall during her freshman year. While in college, an internship with former U.S. Rep. Bob Wise, D-W.Va., led to a full-time job with him after she graduated. "She's in charge, but not in an overt, 'I'm-the-boss' kind of way," Wise told the mercurynews.com. "She's fearless and very firm when it comes time to say: 'This needs to be done.' "
Sorry, guys. Hersman is married to her high school sweetheart, Niel Plummer. The two have three sons. According to her official biography, she also holds a commercial driver's license and a motorcycle endorsement.